It is funny how something as enjoyable as golfing can be such a divisive matter in a relationship. Every golfer who has ever dated a non-golfer knows what we are talking about. Non-golfers simply don’t understand that this game is one of the best things in the world. Luckily, there are quite a few golf dating websites to choose from and today, we will talk about one of the best you can find on the Internet in this Golf Dating Club review. Let’s start from the top. We think that a golf website should make you feel relaxed but energized from the moment you log on and Golf Dating Club does this perfectly. The combination of the green and the white immediately makes you think of your favorite course and your favorite hole. The welcome photo usually features a smiling, energetic couple of golfers who were lucky enough to meet online and find that person who will always be ready for a quick trip to the golf course. The welcome page also gives you an insight into the features you will find on the inside and we think this is a great policy. Let people know what they can expect even before they register, even if the registration is free, which is the case here. Our first impression of the website was enhanced by a set of profiles you can swipe through on the very welcome page. This lets you know what kind of crowd you can expect to find on the website. All in all, our Golf Dating Club review started off on the right foot. We already touched upon the design in the previous part of our Golf Dating Club review, but we feel we need to talk a bit more about this important aspect. The main reason for this is that we like it so much. We mentioned our love of the white and green combination, but we would also like to point out that it definitely wasn’t as simple as just putting together green and white. You need the right shade of green and they did it perfectly here. It is the kind of green that almost makes you smell the freshly cut grass early in the morning. People do not make a hole in one that often when it comes to the design of a dating website. Golf Dating Club folks nailed this, which has greatly contributed to the site’s functionality. Golfers do not have time to waste and that is why Golf Dating Club is not only laid out perfectly but also expertly optimized. The highlight of Golf Dating Club are the profiles. There is no doubt about that. Your profile is what will get you dates and you better spruce it up all nice. If you have a camera, create a brief video about yourself. Perhaps show off your stroke. Once you have done that, you will be checking out other people’s profiles and contacting those you think are interesting. If you are a bit shy, you can send them a flirt. Once they flirt back, the game is on. Chat rooms are another fantastic feature, providing you with stuff to do while you wait for your flirts to respond and also giving you a chance to learn more about those people who may not have caught your eye at first. One of the best things about doing this Golf Dating Club review was definitely meeting great people. The website is still in its infancy and the niche is somewhat narrowed down, but there are more than enough amazing people to meet and talk to on Golf Dating Club. These are all fans of golf and we spent hours on end discussing the best clubs, the best courses, and dream golf games. We like to keep things strictly friendly when doing these reviews, but we are pretty sure we could have done much more with many of our new friends. Golf Dating Club is one of the world’s premiere golf dating websites and we had a great time doing this Golf Dating Club review. The website looks great, it runs like clockwork, and the people are friendly and true golf enthusiasts. Check, check, check. 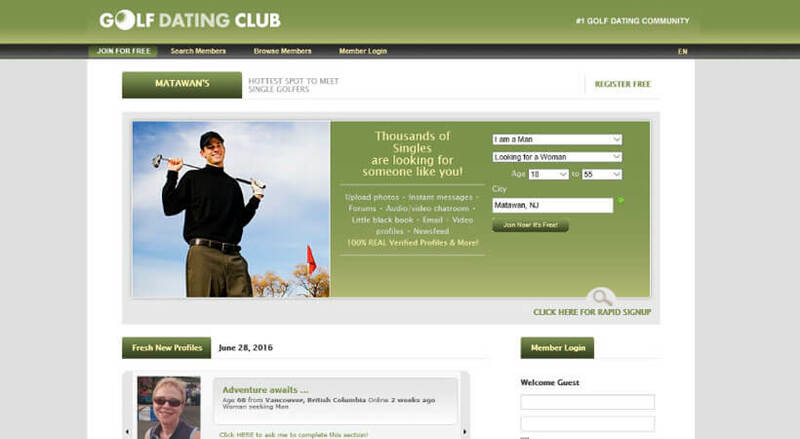 Kudos to whoever got the idea of creating a dating website just for golfers! As a single golfer I got to say it’s most appreciated! Good job and all the best! This is one of the best dating sites I’ve ever been a member of. Other, bigger websites are too bug, and it’s easy for scammers and fake profiles to go unnoticed. Here, there are almost no fake profiles at all, and if there is one, it’s very easy to spot and report. It makes me feel safe and relaxed and I’m more comfortable approaching other members for conversation and even for straight up date proposals. Everything works excellent and the design is nice.